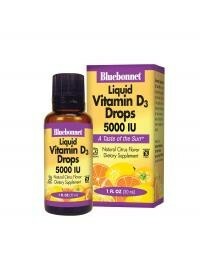 Bluebonnet’s Liquid Vitamin D3 Drops 5000 IU provide natural vitamin D3 (cholecalciferol) from lanolin. Each drop of this sunshine vitamin is flavored using a hint of orange and lemon essential oils. Available in liquid drops for maximum assimilation and absorption.